[値下げ] SpellStacker | Mac App Storeのアプリ検索・ランキング BuzzMac! 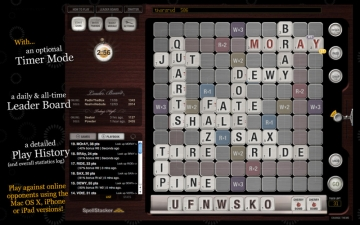 If you consider yourself a word game pro, this game will deliver exciting, new challenges. The timer mode gives you big rewards for fast thinking. 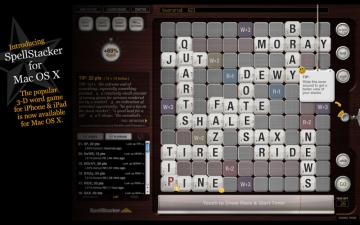 Stacking tiles up to three layers means word intersections are often more valuable than double word scores. Moving bonus squares add an element of excitement with unexpected high-scoring opportunities. 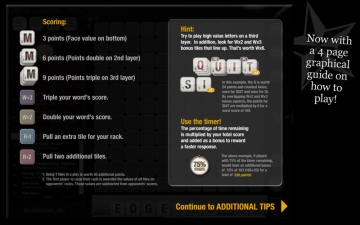 In 'solitaire' mode, your winning strategy will be very different than in word games against a computer or other player: building off of smaller words has more play-after-play value, and the tiles you don't play are as important as the ones you do as you wait for the rotating bonus squares to line up. 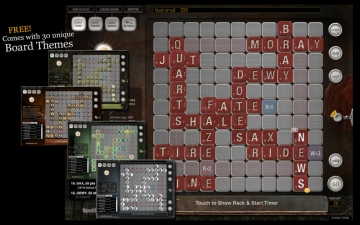 In person-to-person mode, bigger words have more strategic value and bomb tiles can be used to remove a player's tile dropped in "your spot." Challenge yourself against the established leader board scores. You'll be surprised by the tactics required to compete against current champions. But that's not all! For one low price, you'll also get over 30 unique board themes including the award winning "Fridge Magnets" theme and the always-a-favorite "Uncle Jerry's Couch" theme. Plus, you'll receive several add-ons that can improve your game play or simply give your score a quick pick-me-up while you're learning. 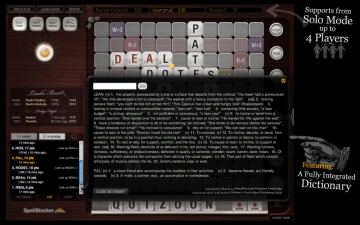 These themes and addons each cost 99 cents in the iPhone/iPad version, but since the Mac App store does not yet support in-app purchases, all of these features have been bundled in this introductory Mac OS version for no additional cost. OS X 10.6 with a minimum screen resolution of 1024x768 is required. For images and a complete description, please visit www.spellstacker.com.